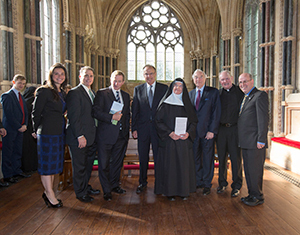 Hosted by the Benedictine community at Kylemore, guests included Irish businessman and Notre Dame trustee emeritus Martin Naughton and his family, as well as Nicholas Entrikin, vice president and associate provost for internationalization; Warren von Eschenbach, assistant provost for Europe; Rev. Timothy Scully, C.S.C., director of the Institute for Educational Initiatives; Lisa Caulfield, director of the Notre Dame at Kylemore program; and Kevin Whelan, director of the Keough-Naughton Notre Dame Centre in Dublin. Programming at the Kylemore center, which will span an array of academic disciplines, will begin in May 2016. The arrangement will allow students from Notre Dame to use the Abbey, a former boarding school and the home of the Benedictine nuns, as a residential facility. The programs will combine the scholarly rigor of Notre Dame with the rich tradition of Benedictine spirituality. Courses will also be offered in partnership with Irish and European universities. Notre Dame also has an urban presence in Ireland on Merrion Square, Dublin, in the historic home of Daniel O’Connell, which every year enrolls Notre Dame students in a study abroad program. The new program at Kylemore will provide a rural setting located in the idyllic heart of Connnemara and will offer intensive short-term courses and modules with master class offerings and will bring world-renowned scholars to teach Notre Dame and Irish students alike, in a spirit of collaboration and partnership with Irish universities. Originally published by Michael O. Garvey at news.nd.edu on September 29, 2015.